An absorbing and moving series of photographs that depict some of the less familiar aspects of the grinding realities of life on the Western Front. For all the significance attached to the brave, doomed heroism at Gallipoli, the Western Front was the single greatest wartime tragedy that elicited the greatest sacrifice. 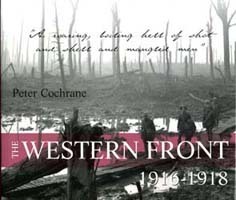 Of the 60 000 who died in the course of the war, 45 000 were lost at the Western Front. In a matter of weeks, more Australians were slain in one or two battles than in the entire eight months at Gallipoli. Those terrible years represent the whole panoply of modern warfare. There exists a substantial photographic record of life and death at the Front. Not all the photographs were taken by official war photographers. At the time, Kodak was marketing a pocket camera for soldiers. Although it was against military orders, many soldiers smuggled camera & film out of the battle zone. They were a new kind of macabre tourist, keen to capture something of their experiences. The result is a powerful visual record of Anzacs at the Western Front. Using these photos, The Western Front looks at the major battles of the campaign, the grim conditions endured by the soldiers, the workers of the massive support system, the heroic efforts of stretcher-bearers and medical workers and, finally, the run of victories under Monash in which Australian soldiers distinguished themselves beyond their numerical presence.